Born October 1 1902 in Hunan Province and died December 28 1986 in Beijing. General Huang Kecheng became the Hunan Provincial Secretary after the proclamation of the People's Republic of China. Commander of the Hunan Military Area and Political Commissar. In November of 1952 appointed as Vice General Chief of Staff CPLA. In 1954 became Vice Minister of the Defense Department in China. Promoted to General of the Army in 1955 (Equivalent to 4 Stars). 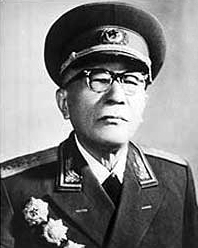 Huang Kecheng was conferred the rank of army general in 1955. 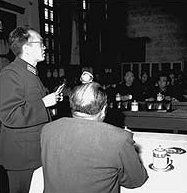 On May 5, 1959, Huang Kecheng(left) was making a report at the plenary session of National Defense Committee. 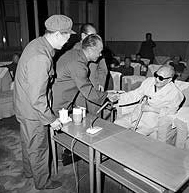 On June 1982, Huang Kecheng (sitting on sofa) attended the forum of the Central Military Commission in June 1982. 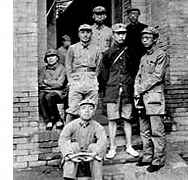 A picture taken at Yunyang Town, Sanyuan County,Shaanxi Province in 1937, Huang Kecheng were with Yang Shangkun(sat on the front row). From left on the second row are: Li Bozhao, Deng Xiaoping, Yang Qiqing, Lu Dingyi; from left on the third row are:Luo Ronghuan and Huang Kecheng. Huang Kecheng(right) and Song Renqiong were on the Tiananmen Rostrum on October 1, 1955.